We all know this is true. 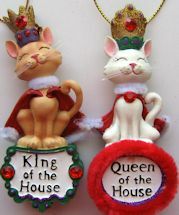 They are king or queen of the house. Each resin cat ornament is 3 3/4" high x 1 3/4" wide. Gold corded loop for hanging. (Notice the smile on their faces). Select either king or queen.